1977 Alaska Registration Sticker NOME - $20.00 : Bob Hoyts Classic Inspection Stickers, Add a Final Touch to your Restoration! 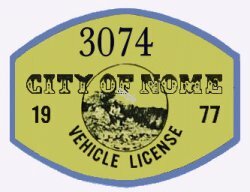 It is a 1977 Nome Alaska registration sticker to indicate the car was legally registered in Nome. Rgistration also equired an inspection.